An easy and inexpensive way to start saving water is by installing low flow aerators on your faucets. 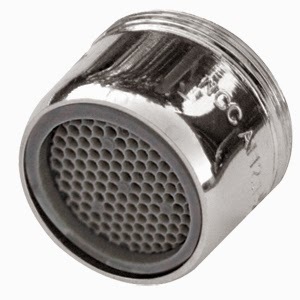 The aerator is the part of the faucet that controls the flow rate (the amount of water that comes out of the faucet). 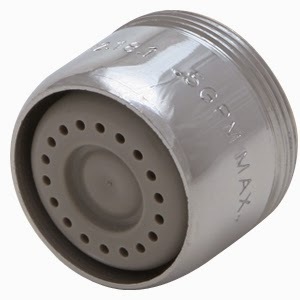 faucet aerators conserve water, while shaping the stream uniformly and reducing splashing. Water is delivered in softer, almost ticklish mini jets, rather than a standard gush. Standard faucets have a flow rate of about 2.0 GPM (Gallons per Minute). This means that for every minute 2 gallons of water flow out. Low flow aerators reduce the flow rate to as low as 0.5 GPM which is a 75% reduction in the water used. When looking at this from a short-term angle the benefit seems minimal however when you apply this to a long term focus, there is a massive savings on the amount of water used and on your water bill.